Callum Christie's memories of growing up with heroin addict parents are so shocking that he suffers from post-traumatic stress disorder but posting Youtube videos about his life has built his confidence. 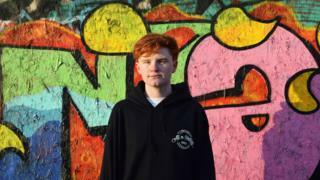 Seventeen-year-old Callum's parents were drug addicts and one his earliest memories is of police raiding their home, when he was about four. He tells BBC Scotland's Kaye Adams programme: "Growing up there were constantly drug addicts in the house, people taking heroin in every room." He says that as well as countless police raids, he saw his parents being mugged and his home ransacked. "I was scared of my own house half of the time," he says. Callum, who lives in Dundee, says he was first removed from his parents when he was about eight when he went to live with his mum's father. After about three years he went back to his parents but was taken away again when they "picked up their old habits". He now lives with his great-grandparents. "It's the best thing that ever happened to me," he says. "It's a very different environment. It is a lot nicer living in a house where I know the door is not going to get smashed in." Callum says he went through a phase of having a very bad relationship with his parents but that has improved. "There was a lot of anger and stuff but now it is a kind of calmer relationship I have with them," he says. However, he says he is determined not to make the mistakes they made. "The way I see it, I don't want to be what they are so I will do everything in my power to be the opposite of what they were," he says. He has been posting videos to Youtube since he was very young but it is only in the past 18 months that he has embraced vlogging. He records his daily activities around Dundee for his subscribers to watch. This might be trips to the skate park, exploring abandoned buildings or trying out challenges. As well as going to college he tries to post videos three times a week. Callum says he wants it to be a career and makes some money from advertising sold around the videos. "I wake up and think 'what am I going to do today?'. "The best part is when people enjoy watching my life." In order to be able to post personal videos, Callum has had to force himself to conquer his anxiety and become more confident. "I knew that if I wanted to do Youtube as a career I had to be as confident as possible so growing up I have forced myself to be a confident as I can," he says. Anthony Browne, BBC Scotland's social media executive. says vlogging can be "very empowering for young people". He says: "If they have got something interesting to say they can speak to the whole world. "Callum is a good example of someone who has taken that opportunity to empower himself and give himself a voice where he wasn't heard before." The videos have led to Callum becoming well-known around Dundee, he says, with people stopping him to say they have seen his vlogs. Callum says: "I have had some really weird encounters, for example, I was asked to sign a fish at a skate park once. "I have also gathered a lot of friends from doing this. There are three other Youtubers from Dundee that I've worked with and they are killing it as well right now." Callum says picking up his camera makes him feel better and even online abuse cannot dent the feeling vlogging gives him. "I have always had problems and bullying for doing Youtube," he says. "It does not really strike me any more. "The way I see it I'm almost making a living off me and my friends skateboarding so it's no problem for me to get a nasty message."